Inuvik East Three School Secondary students had a chance to hold and learn more about different Inuvialuit artifacts. East Three Secondary School students in Inuvik, N.W.T., had a chance to hold Inuvialuit artifacts and learn more about them. The Inuvialuit Living History Project, which aims to try and reunite Inuvialuit with these objects, hosted a three day event last week. Principal Gene Jenks said the interactive learning was a great experience for students. "They were blown away by the artifacts, the workshops. [It was] totally an engaging experience and it's just history brought to life." The project first brought a group of Inuvialuit elders to the Smithsonian National Museum of Natural History in Washington, D.C., in 2009, where it holds the MacFarlane Collection — about 550 artifacts collected by Hudson's Bay Company clerk Roderick MacFarlane during his travels in the Northwest Territories between 1860 and 1870. The project contributes knowledge they receive from elders during past visits to the project's website. 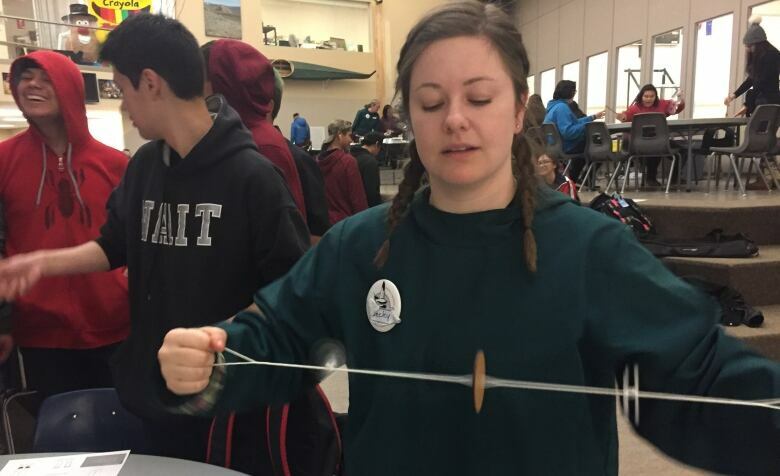 This time, they are giving students a chance to immerse in Inuvialuit culture. From Wednesday to Friday, students had a chance to ask different questions about the artifacts and replicas that were brought from Ivvavik National Park and Yellowknife's Prince of Wales Northern Heritage Centre. "I think it's great too because we see them in pictures and stuff, and we learned about them long ago but we've never actually seen them in person," said Paris Wainman, a Grade 11 student. During the community feast on Wednesday, community members also had a chance to see the objects. 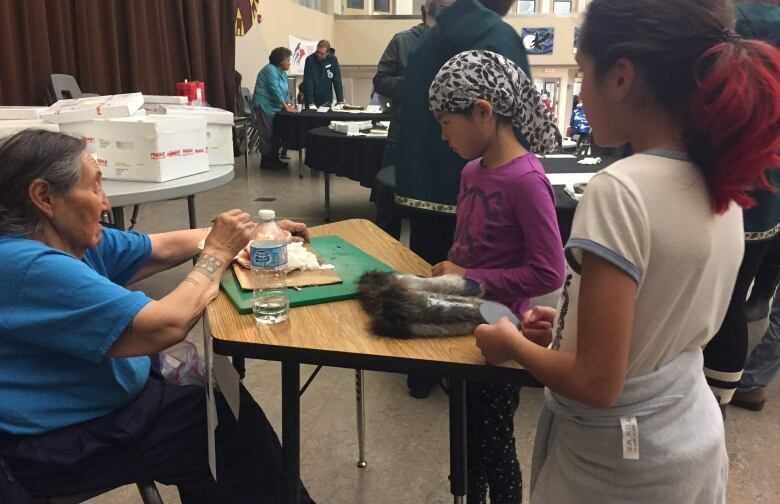 About a dozen elders and other Inuvialuit from across the region joined the students to play some traditional games, share stories and teach the culture. Elder Mary Kudlak from Ulukhaktok even brought her qulliq, which is a traditional oil lamp. 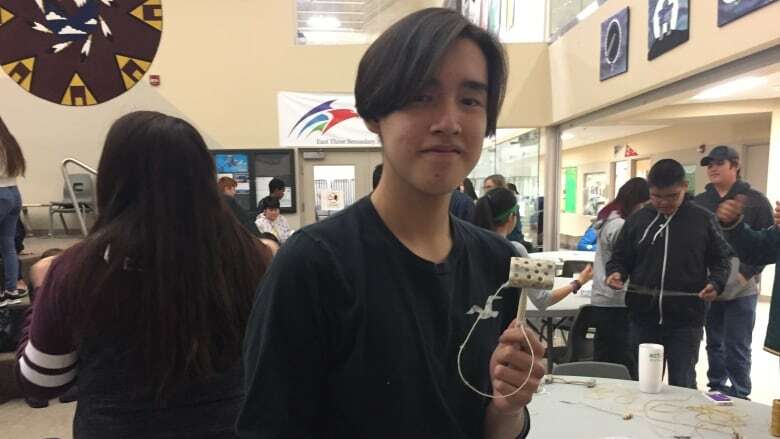 Inuvialuit student Shaomek Bernhardt was playing with some of the objects such as the Ayagaq, a traditional toy on a string, and said he hopes this becomes an annual event at school. "I think it's really cool that we get to see what kind of tools they used in the past," said Bernhardt. Those who are helping out, feel like the event has been an amazing opportunity for students. 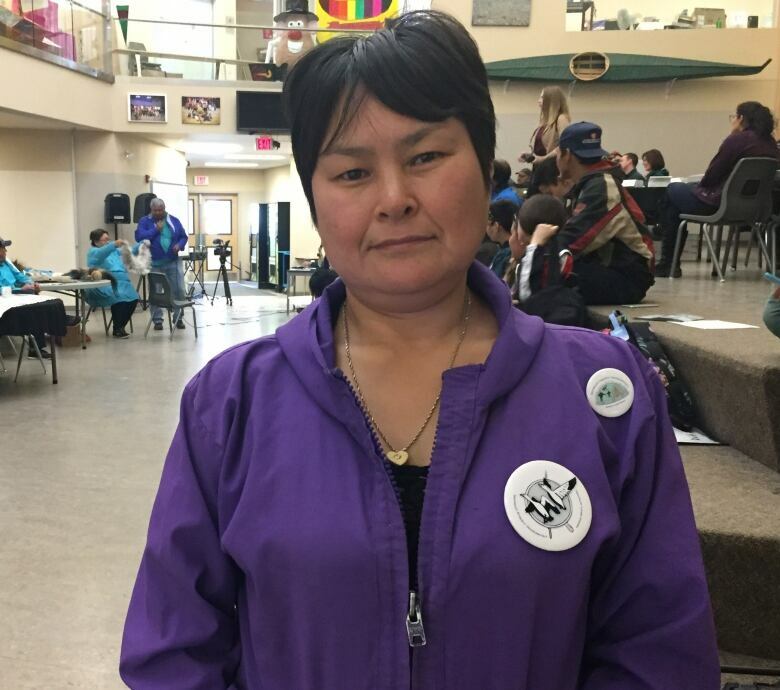 "They're pretty lucky to be part of what is happening — to invite them, to educate them about their ancestors, about what they are made [of], where they found them," said Josephine Nasogaluak, who came from Tuktoyaktuk with her husband to teach students how to make fish hooks and earrings. Representatives from the Inuvialuit Living History Project said they were amazed at the response and it was a chance to allow multiple generations to bond over the Inuvialuit culture. 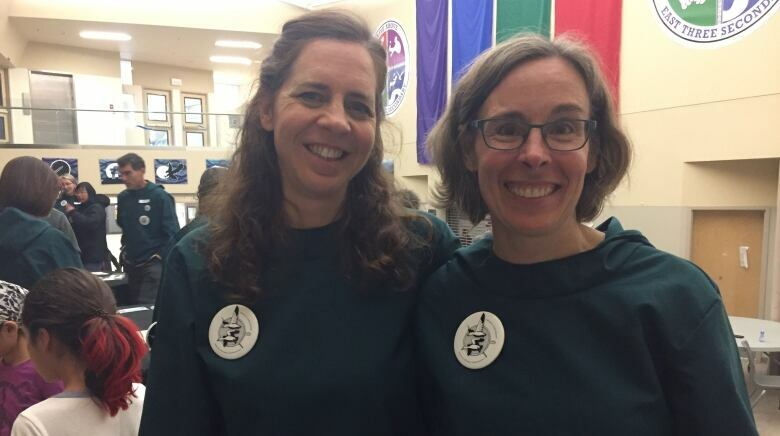 "A lot of the elders that are here are reminiscing about things from their parents and grandparents," said Lisa Hodgetts, who is with the project and an associate professor in the anthropology department at Western University. "It was really fun this afternoon just watching because of every time we thought we were done, a hand went up." Next year, there are plans for a land camp.